According to Indonesia’s Tempo newspaper, the government will temporarily close the popular tourist attraction in January 2020. A reopening date has not been announced. During the closure, conservationists will examine the lizards’ food supply, work on preserving endemic plant species, and survey the natural environment. Conservation authorities hope that the closure will help grow the Komodo Dragon population. Komodo dragons are very valuable on the black market. Komodo Dragons are a protected species and considered to be the largest living lizard in the world. They are capable of growing up to 10 feet long and weighing up to 200 pounds. They have poisonous saliva and can be dangerous — but the World Animal Foundation estimates there are only about 6,000 left in the wild, all concentrated in Indonesia’s Komodo National Park. But it will still be possible to see the animal come 2020. 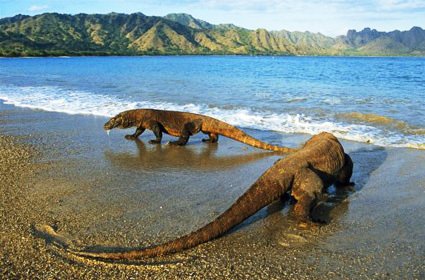 Only Komodo Island — which has an estimated Komodo population of about 1,800 lizards — will close to tourists. It will be possible to see the animals in other parts of the national park, including Rinca and Gili Motong islands. This is not the first popular tourist island that has closed for conservation purposes. In 2017, Thailand indefinitely closed four of its islands to protect the coral reefs from overtourism. Komodo island — home to the only wild Komodo Dragons in the world — is closing to tourists for a year, according to local media reports. Komodo Dragons are a protected species and considered to be the largest living lizard in the world. Their population in the wild is thought to number around just 6,000.